RambleRoam is a free browser add-on for those computer users who want to get the best online deals and other shopping related information. RambleRoam works on Internet Explorer, Google Chrome, and Mozilla Firefox. The application is available at rambleroam.biz, and is identical to many other applications, including Blarble, TasticSurf, and Web Flipper. 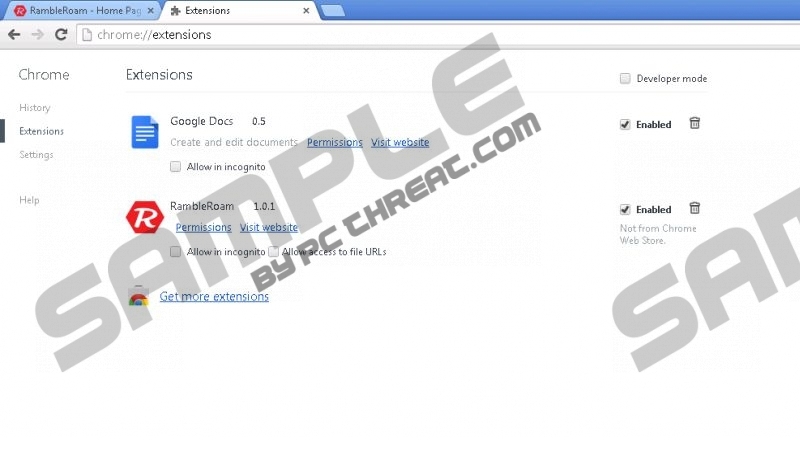 All these browser add-ons are developed by SuperWeb LLC and are categorized as adware. RambleRoam, as well as the programs mentioned, can be removed from the computer by powerful spyware removal tools, and, if you want to have RambleRoam removed for you, you should implement a reputable spyware and malware removal tool. Another important fact concerning the behavior of RambleRoam is the capability to monitor. The application records you clicks, search terms, IP address, impressions, browser type, browser language, your browsing history, time spent on various websites, and some other non-personally identifiable information. However, the information collected by RambleRoam may contain some pieces of personally identifiable information and may be used for targeted advertising, which you can prevent by removing the adware program from the PC. If you have RambleRoam on your browsers, you know that a great majority of the pop-ups are not related to your browsing interests, and you can easily rid you browsers of those annoying pop-ups. In order to remove RambleRoam from the computer, you can either use our removal guide provider below or implement a reputable spyware removal tool. We recommend that you choose the latter because your system needs to be shield from various computer threats. SpyHunter can provide you with protection against malware and spyware, and, without a doubt, remove RambleRoam. If you are determined to try removing RambleRoam manually, we suggest using our removal guide. After uninstalling the adware program, you should scan the PC. Click the download button below to download a free scanner, which can easily determine what unreliable files are present within the system. Quick & tested solution for RambleRoam removal.